Caesar may not have instigated the War For the Planet of the Apes – that credit goes to Woody Harrelson’s fearsome warmonger, The Colonel – but at least based on today’s all-new TV spot for the Matt Reeves-directed threequel, he fully intends to be the one to finish it. Brought to life by veteran actor and all-around motion-capture maestro Andy Serkis, it seems that Caesar has been plotting his quest for revenge ever since the aftermath of Dawn of the Planet of the Apes, and though we fully expect Fox’s sequel to explore the moral dilemma raging beneath Caesar’s fuzzy, blood-speckled fur, War looks set to dial the action up to 11 and rip the knob off entirely. Perhaps the most haunting shot included in today’s snippet is the one in which Harrelson’s antagonist, still in the process of shaving his head, walks out to a sea of crazed supporters/disciples with their guns held aloft. From the looks of things, they’re spouting some barbaric war chant, and that can only portend all kinds of danger for Caesar and his dwindling simian army. He has shown the remaining humans mercy but now, it’s almost time for war. 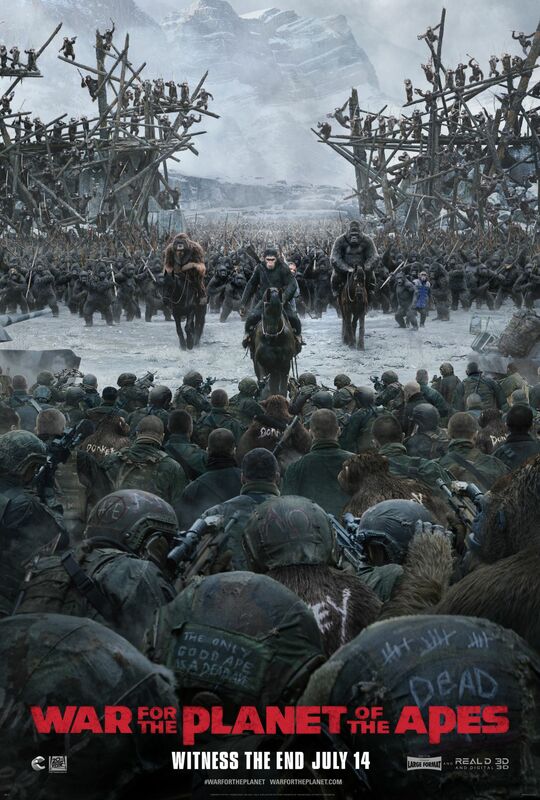 Dubbed the “conclusive chapter” in 20th Century Fox’s rebooted trilogy – for now, at least – War For the Planet of the Apes is expected to march directly into theaters on July 14th. The combined box office total of Rise ($481 million) and Dawn ($716 million) puts Fox’s lucrative Apes franchise far past the $1 billion mile marker, so there’s no telling how far that number will climb in two months’ time. Will War be the one to crack $1 billion on its own? It’d be foolish to think otherwise.